Two bedroom cotttage on the west shore of Round Lake with excellent swimming. Cottage bookings are Saturday to Saturday in July and August with 3 day bookings in spring and fall. Cottage is 2 has bedrooms with one 3 piece bathroom, sleeps 7. Includes, with no additional fees 16 ft canoe, two sea kayaks, a junior kayak, standup paddle board, life jackets, hammock, dock, boat mooring anchor, 3 bicycle's, BBQ and propane, bonfire pit with wood, chairs, pick nick table and games room with ping pong and darts, etc. One bedroom with a double bed and second in a large long room with two twins and a bunk bed. 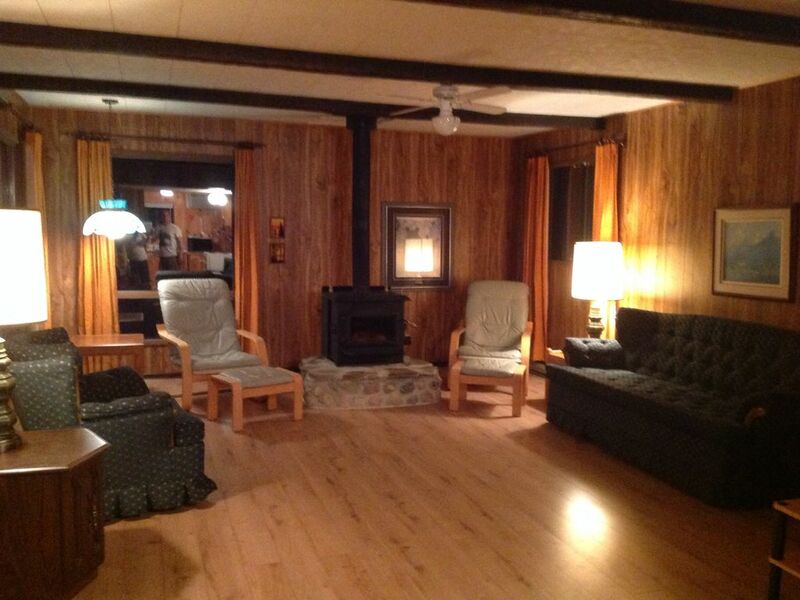 Living room has an excellent view of the lake with air tight wood stove on a stone hearth, electric heat throughout. Games room is in one bay of the garage. The west side of the lake is usually calm with prevailing westerly winds blowing off shore, great paddling since located in the bay between the Bonnechere and Sherwood rivers. I grew up on Round Lake and know the area very well. Depending on your interests I can assist with recommendations on hiking, site seeing, boating, fishing, shopping, entertainment and local amenities. I live a couple cottages away invested in this cottage for the family future generations. Round Lake and it sand beaches are pristine since the lake is the first lake on the Bonnechere River with the water shed coming from Algonquin Park. We are close to 3 provincial parks, Bonnechere at the end of the bay with heritage buildings, events, and walking trails, Foy Park with sand beaches and trails as well as Algonquin Park with Barron River Canyon, Natural Water Slide, and the East Gate Visitor's Center, Logging Museum and many walking trails. If you fish round lake has excellent Bass and Lake Trout plus many nearby lakes with bass, speckle trout, lake trout and pike. Typical 3 piece bathroom with shower stall, no tub. Cottage is on the West shore of Round Lake, Bonnechere Bay between the Bonnechere & Sherwood Rivers. Sand lake bottom, no weeds, shallow while gradually deepening. Rip Rap on shore to stop erosion. Provided, bring your own if you wish..
Large 4 bay garage, one bay is the games room included with rental, 3 other bays are not included. Bath towels provided, bring your own if you like, beach towels are not provided. Air tight wood stove on stone hearth. Large living room with great view of the lake. Can also dine outside at pick nick table. TV has built in DVD player. One bay in Garage has a Ping Pong Table and Dart Board. Several board games, plus games room in garage with Ping Pong table and Darts. Some water toys for kids, surf boards, shovels, squirt guns, balls, etc. 60 or so DVD movies. 16 foot canoe, two sea kayaks, one junior kayak, and stand-up paddle board. Three adult Mountain Bikes and one Junior bike. Live jackets, canoe safety kits. Many near by courses in Killaloe, Eganville, Barrys Bay and Pembroke. Is a bungalow with a level lot so would be easy to manage with a wheel chair. A comfortable place to relax and enjoy some time with our children. and there are many family oriented activities available to do in the area. This is a great place to hang you jay for a short or long while. My boyfriend and I rented this cottage for a week in August, and had a wonderful time! The cottage is very clean and well equipped, while still having a 'rustic' cottage feel. The lake is perfectly clear with sandy bottom, and we were able to canoe to the Bonnechere River for fishing (small fish) every day. The owners are very nice and helped give us ideas of what to do in the area. There are nice paths in Bonnechere Provincial Park for running or walking, and we drove to Algonquin Park (East Gate, 1.5hour drive) for a day hike and had a great time. Would definitely recommend this cottage, we miss drinking our morning coffee on the quiet dock! My husband, daughter, in-laws, and I had the opportunity to stay at this cottage last summer. The location was great for EVERYTHING. We brought our boat to go out fishing, took walks into Bonnechere Park, went swimming (the bottom was sandy and perfect), went canoeing into the Bonnechere River which was breathtaking and so much more! There is also a great set-up in the games room, so if the weather isn't cooperative you won't be bored. Just thinking of morning coffee on the lake makes me want to go back this summer. The owners were awesome and let us know where to go hiking, canoeing, and about the little shops in Barry's Bay to go to on a rainy day. This cottage is a great spot for a family or couple getaway! Next door to Bonnechere, Foy and Algonquin Provincial Parks containing heritage buildings, Sand Beaches, Walking Trails, Baron River Canyon, Natural Water Slide, Algonquin East Gate Visitors Center, Logging Museum, etc. Round Lake is the first lake on the Bonnechere River system, having pristine water from the Algonquin Park watershed. The Lake is a cold water lake having a natural Lake Trout fishery, the lake has many sandy beaches, with a sandy bottom every where with very few weeds. The Cottage location on the West shore is blessed with prevailing off shore winds resulting in calm water. You see the sun and moon rises in the summer months, sunsets can be seen when you are out on the water. The lot is treed with large White Pine trees and off the main highway on a private drive so road noise is not heard. Signed Rental Contract is required.